Andre Ward spent the final moments before his fight with Sergey Kovalev on Saturday night resting in his dressing room and watching video of Bernard Hopkins’ 2001 victory over Felix Trinidad: a cagey veteran using boxing skills to subdue a highly touted knockout artist. What unfolded in the ring between him and Kovalev at the T-Mobile Arena in Las Vegas did not exactly replicate the dominant display with which the American upended the Puerto Rican in New York 15 years ago; but after 12 hard-fought rounds, Ward had nonetheless emerged the victor and new light-heavyweight title holder by the slimmest of margins, picking himself off the canvas to win what was surely the toughest contest of his illustrious career. All three judges delivered scores of 114-113 at the end of a bout that could easily have been scored by a similarly close margin the other way. That it would even last that long seemed unlikely at the conclusion of the fight’s first two frames. 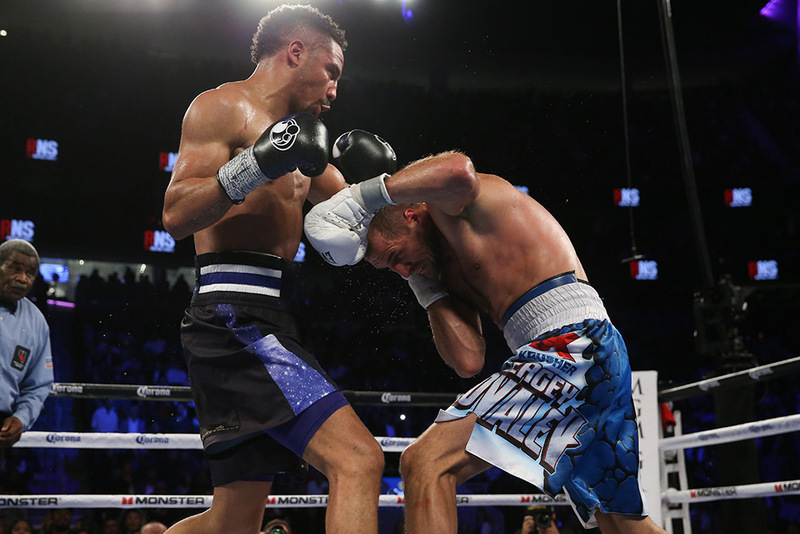 Ward (31-0, 15 KOs) looked tentative, unsure what to do with Kovalev’s stiff jab and straight right hand, the latter of which landed with thudding power in the middle of the American’s face to send him tumbling to his knees in the second round. Hitting the canvas on only the second occasion in his career – and for the first time since his seventh pro bout – seemed to wake Ward up, and after surviving the Kovalev onslaught he came out with greater purpose in the third, possibly edging the frame with a pair of leaping left hooks that thudded into the side of the Russian’s head. Kovalev regained the initiative in the fourth, however, working again behind a stiff jab and keeping the fight at a distance that enabled him to throw and land his longer, straighter punches. He was growing increasingly wary of the fast counters that Ward was beginning to throw, however, opting not to overcommit when he had Ward backed to the ropes. The next couple of rounds saw first one man and then the other in the ascendant, Ward closing the distance to suit his tastes and enable him to land his faster, more looping blows, and then Kovalev pumping his jab some more, keeping Ward at bay and seeking to land his right hand over the top. By the seventh, however, the momentum was clearly with the challenger, who was beginning to look much more comfortable and willing to exchange with the hammer-fisted champion. As the two grappled when they were in close – something they did a great deal throughout the evening – Ward took the opportunity to thud right hands to Kovalev’s body, which seemed to sap some of the strength from the man from Chelyabinsk and discourage his continued assault. 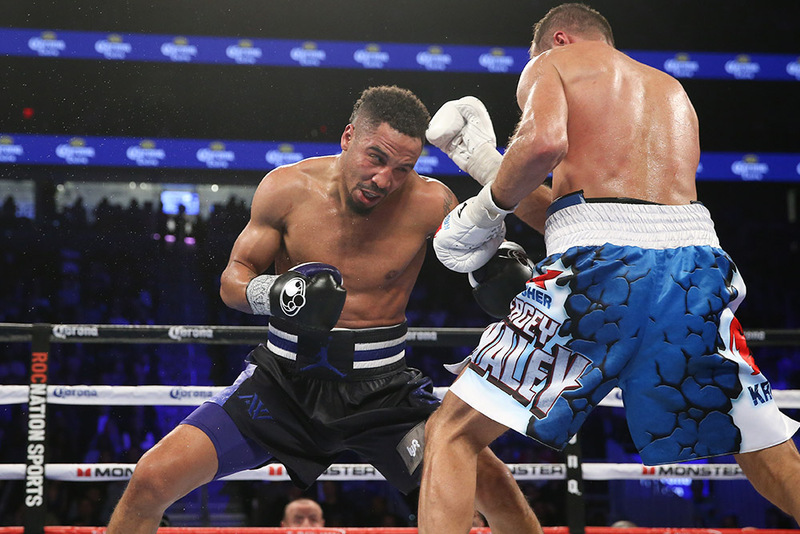 Ward even went on the attack to start the tenth, launching himself from the corner toward Kovalev (30-1-1, 26 KOs), but the Russian was ready for him, and in fact had his most successful round of the second half. 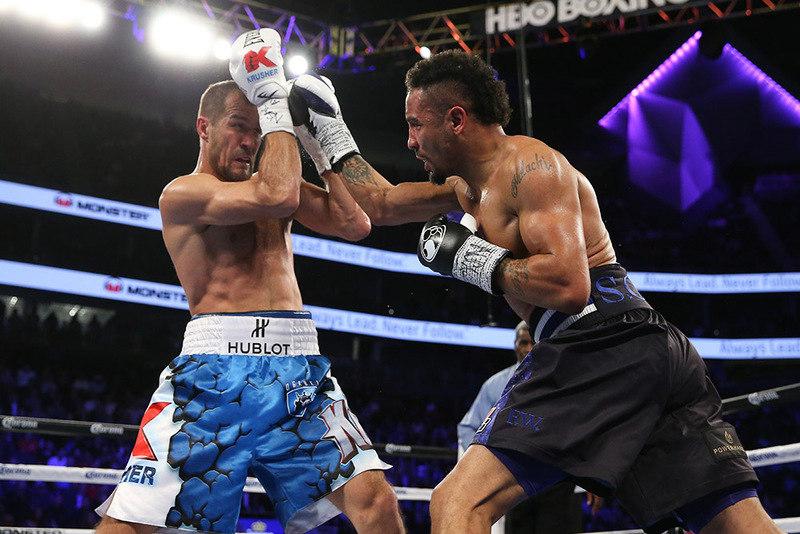 Ward lunged with a right hand and Kovalev met him with a short right hand inside. Kovalev landed an uppercut, a jab and a right hand. Both men faked bolo punches, and Kovalev interrupted Ward’s with a spearing jab to the nose. But by round’s end, Kovalev had a bloody nose and the pro-Ward crowd of 13,310 scented his victory was near. 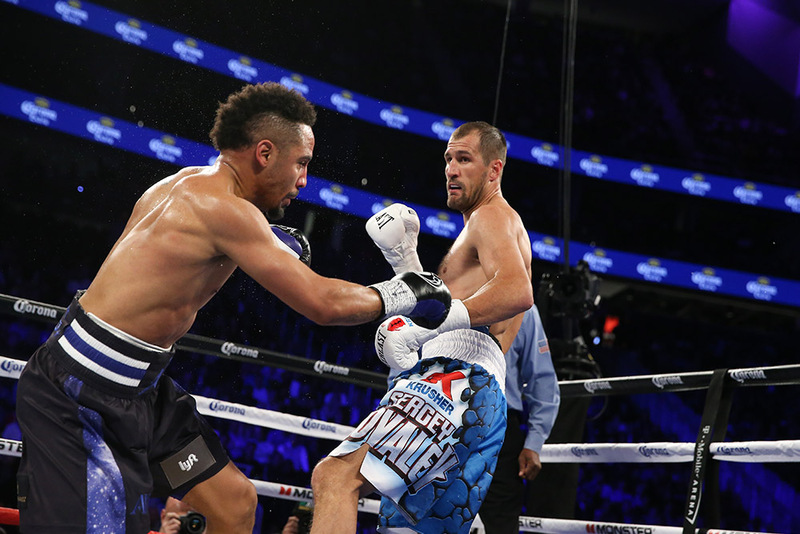 The championship rounds saw a tiring Kovalev in pursuit of a Ward who circled, retreated, and then launched sweeping hooks and right hands to halt the champion in his tracks. The two men exchanged furious punches as the clock counted down on a first-rate prizefight between two outstanding professionals, and at the final bell neither man could have been sure to have his hand raised by referee Robert Byrd. The CompuBox stats underlined the closeness of the contest, Kovalev with advantages in punches thrown and landed and Ward landing at the higher connect rate. In total, Kovalev landed 126 of 474 punches, for a connect rate of 26.6 percent; Ward’s 116 landed out of 337 thrown garnered him a connect rate of 34.4 percent. Not that Kovalev saw it as a debatable result. “It’s the wrong decision,” he said. “I don't want to say my opinion, witnesses are here. They saw." His promoter Kathy Duva – who has already called to exercise a rematch clause – agreed. Ward, unsurprisingly, saw it differently.